"Protected area" will be encrypted(AES256) by default setting, when install USB Flash Security to USB drive. The following contents is for the USB drive that the setting is "encrypted Protected area". (Ver.2 or before Ver.2 does not have encryption function(AES256)). Connetct the USB drive which installed security and confirm the file in USB drive by explorer, you can see "Release tool"(UsbEnter.exe) in "Unprotected area" and you can not see the files in "Protected area". This moment the files in "Protected area" is protected by encryption. File name, folder name, data file,ect. all of the info. in "Protected area" has been encrypted. So file can not be analyzed. 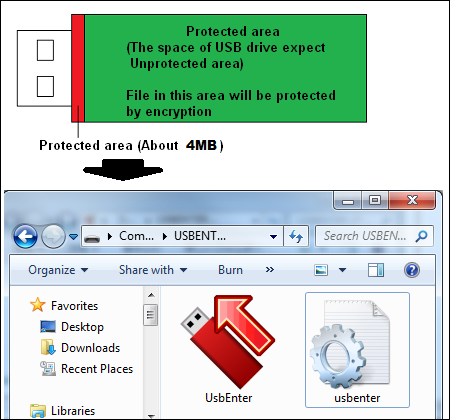 After input password and unlock security by "Release tool"(UsbEnter.exe), encrypted files in "Protected area" can be seen and used normally. The following contents is the structure of encoding and decoding, after unlock security. When copy the file from PC to USB drive, file will be encoded automatically. When copy the file from USB drive to PC, file will be decoded automatically. When open the file in USB drive by Word or Excel ect., file will be decoded and read automatically. When save the file in USB drive by PC software, file will be encoded and written automatically. The password which set by install "USB Flash Security" to USB drive (Group editon uses administrator password) will be used as encode key. So the encoded data is different by different password. It can provent the data from the analysis of the other one who does not know the password. AES256bit encryption need 32 characters encode key. When the password is less then 32 characters, program will add a letter to become 32 characters and use the 32 characters as encode key to encode(256bit) data automatically. when save the above file to the USB drive installed "USB Flash Security. It will be encoded automatically. And the following image is the encoded data. *Encoded data is different by different encode key. To enhance the security, we recommend you to set the password more then 8 characters with alphanumeric characters, when install "USB Flash Security" to your USB drive. The password which set by install "USB Flash Security" to USB drive (Group editon uses administrator password) is used as encode key. Password to unlock security can be changed, but the encode key can not be changed anymore. We recommend that before install "USB Flash Security" to your USB drive, please format your USB drive by windows format. 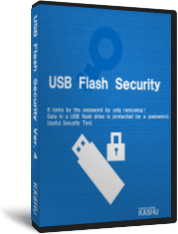 "USB Flash Security" will encode "Protected are", but data before you install software may be recovered by recover software if the data has not be overwritten. Right-click the USB drive in explorer and seclect "Format" in the popup menu. The window as follow will display. 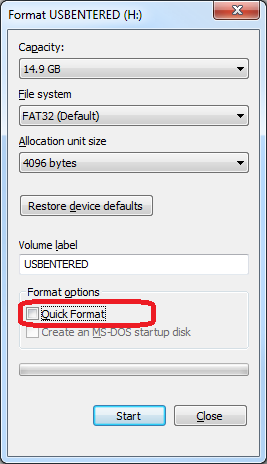 Exclude the chek of "Quick format", then format the disk, all of the data in the disk will be deleted. If you don't exclude the check of "Quick format", data can not be seen in disk after format. But data has not been deleted by this case.